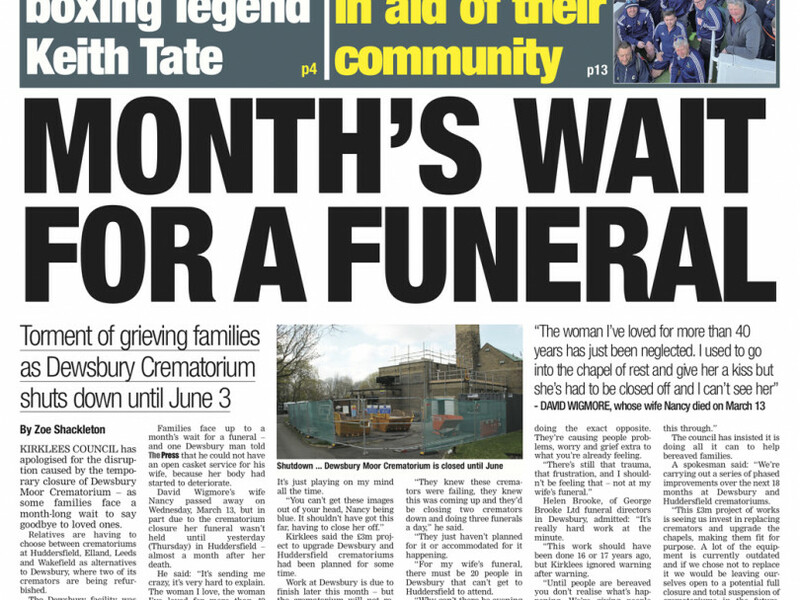 Grab a copy of this week's Press to read how Kirklees Council has apologised for the disruption caused by the temporary closure of Dewsbury Moor Crematorium – as some families face a month-long wait to say goodbye to loved ones. Relatives are having to choose between crematoriums at Huddersfield, Elland, Leeds and Wakefield as alternatives to Dewsbury, where two of its cremators are being refurbished. The Dewsbury facility was holding just three funeral services a day since work started in December, but on Monday the crematorium closed completely for two months. Press publisher Danny Lockwood also writes a tribute to local boxing legend Keith Tate who passed away late last week. We've got news of controversial Dewsbury businessman Tahir 'Terry' Zaman who has been struck off as a director for six years, after nearly £600,000 went missing from one of his companies. Kirklees Council has been forced to clear up the mess left by a group of travellers at Oakwell Hall in Birstall, and a group of campaigners are breathing a sigh of relief after plans to dump thousands of lorry loads full of rubble in an unused railway cutting Heckmondwike were vetoed. Read how a group of volunteers from Hanging Heaton Cricket Club completed a 12-mile walk to raise funds for a community defibrillator, while the life-saving machine could soon be installed at town halls across the district. In sport, it's Challenge Cup fifth round weekend and both Batley coach Matt Diskin and Dewsbury boss Lee Greenwood are aware of the challenges they will face away at lower-league opposition. Dewsbury Moor remain without a win in the NCL but coach Danny Maun is confident they will soon turn things around, while Thornhill Trojans are bottom of the Premier Division after a heavy loss. Ossett United claimed the first piece of silverware of their short history with an impressive win over Guiseley in the West Riding County Cup final, and we have a report and all the reaction. In rugby union, Cleckheaton's battle against the drop will go down to the final day of the season after a high-scoring loss in their penultimate game last weekend. Our preview of the new cricket season continues with a look at the lower divisions, where there is plenty of local interest in Championship One, while racing correspondent Mike Smith shares his tips ahead of the Scottish Grand National.